As part of our mission, Saint Matthew's is committed to sharing our space with local organizations, and we are especially pleased to support local music events. In this vein, Saint Matthew's plays host to the Jamestown Community Piano Association's free admission concert series. There are usually five or six concerts per year, most of which are on Sunday afternoons at 2pm. The Jamestown Community Piano Association was started in 1999 by a group of local music lovers, many of whom were members of Saint Matthew's, who wanted Jamestown to have a fine piano for various musical events. 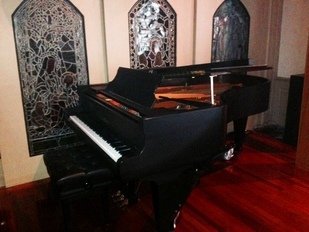 Over the course of two years the group raised $28,000 and purchased a Schimmel seven-foot grand piano (pictured here). The inaugural concert was held in November of 2001. Since that time the Association has presented more than fifty concerts of professional and semi-professional musicians, all of which are free to the public.